Jan Brueghel the Elder, whose delicate brushwork earned him the name "Velvet" Brueghel, executed this lovely small-scale work depicting an expansive river landscape in 1607 at the height of his artistic powers. His painting focuses on daily life in a small town situated at the confluence of a broad river and a smaller tributary, which passes through the town. Gentle pools of light, as well as changes in the color tonalities of the trees and water—from ochers and browns in the foreground, to greens in the middle range, to blues in the distance—ease the transition into depth. The scene likely reflects life along the Scheldt, the main river flowing through the Flemish countryside on its gradual course towards the North Sea. The large church dominating the distant city on the horizon is recognizable as Saint Michael's, the imposing cathedral of the large port city of Antwerp. In the foreground a boatman tenderly passes a baby to its father after transporting the family across the river. The mother, other elegant ladies, and a child are already safely ashore, a second family awaits passage across, and other ferryboats filled with travelers, horses, and cattle approach the landing. Many other figures, including fishermen and families working around their homes, enliven the sunlit riverbank in the middle distance. Brueghel painted this remarkable work on copper, a smooth support that he frequently used to execute his scenes with the extraordinary detail that is the hallmark of his style. What separates his work from comparably detailed paintings on copper by his contemporaries are the expansiveness of his vision and his evocation of man's harmonious interaction with nature, qualities already greatly admired during Brueghel's lifetime. As his great patron Cardinal Federigo Borromeo wrote in 1625: "Even works of the smallest size by Jan Brueghel show how much grace and spirit there is in his art. One can admire at the same time its greatness and its delicacy." Paintings such as this one, with its strong narrative elements and attention to detail, had an enormous influence on Flemish and Dutch landscape artists in the second decade of the 17th century. Brueghel's river views were certainly known to painters working in Haarlem, including Esaias van de Velde and Willem Buytewech, whom Brueghel may have met there when he accompanied Peter Paul Rubens on a diplomatic mission to the Dutch Republic in 1613. Jan Brueghel, was an artist of remarkable versatility. He is justly famed for his atmospheric landscapes and riverscapes, which come alive through the careful yet fluid strokes of his brush as well as through the activities of the figures that populate his scenes. He also painted mythological, allegorical, and historical subjects; evocative scenes of hell; and flower bouquets, many of which include depictions of precious objects. 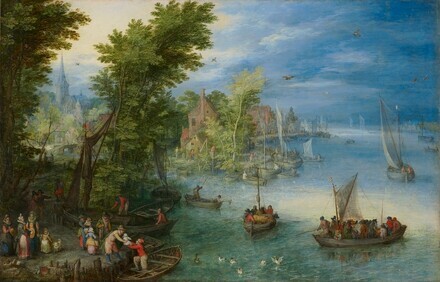 Brueghel apparently received his early training in Brussels, the city of his birth, but his first recorded works date to the mid-1590s, when he was in Italy. His early style reflects the work of Paul Bril, a contemporary artist from Antwerp working in Rome and a close follower of Jan's father, Pieter Bruegel the Elder. In 1597, after returning to Antwerp, Jan entered the Guild of Saint Luke and quickly established himself as an important member of the artistic community. He served as dean of the guild in 1602. In 1606 he became court painter for Archduke Albert and Archduchess Isabella, regents for the King of Spain in the Southern Netherlands. Brueghel, who often collaborated with other artists, including Peter Paul Rubens and Joos de Momper, was highly regarded by royal families throughout Europe for his refined and delicate images, many of which he painted on copper. Duke of Chandos, Canons, Edgware, Middlesex; by descent in his family; (Galerie Nissl, Vaduz); purchased 10 February 2000 through (Galerie Sanct Lucas, Vienna) by NGA. The dealer's invoice to the NGA gives the provenance as "The duke of Chandos, Stowe, thence by descent to the present owner." It has not been possible to determine which duke of Chandos first owned the painting. The first duke of Chandos was James Brydges (1673-1744); he received the title in 1719 and had a large picture collection at his estate, originally known as Cannons. After his two sons, his immediate family had no direct male descendants, and the Brydges connection was handed down through women in the family. The first duke's great-granddaughter, Anna Eliza [1779-1836], married Richard Nugent-Temple-Grenville [1776-1839], who held many titles, including 1st duke of Buckingham and Chandos. Anna Eliza took to her husband's seat in Stowe the bulk of her family's papers, which have been at the Huntington Library in San Marino, California, since 1925. The couple's descendants also used the Chandos title, and most of the dukes of Buckingham and Chandos collected paintings. See P.G.M. Dickson and J.V. Beckett, "The Finances of the Dukes of Chandos: Aristocratic Inheritance, Marriage, and Debt in Eighteenth-Century England," Huntington Library Quarterly 64, nos. 3 and 4 (2001): 309-355; Joan Johnson, Princely Chandos, James Brydges 1674-1744, London, 1984: 172, 175-176; C.H. Collins Baker and Muriel Baker, The Life and Circumstances of James Brydges First Duke of Chandos, Oxford, 1949: xii, xv, 69-83; John Beckett, The Rise and Fall of the Grenvilles: Dukes of Buckingham and Chandos, 1710 to 1921, Manchester and New York, 1994. Hand, John Oliver. National Gallery of Art: Master Paintings from the Collection. Washington and New York, 2004: 228-229, no. 181, color repro. Wheelock, Arthur K., Jr. Flemish Paintings of the Seventeenth Century. The Collections of the National Gallery of Art Systematic Catalogue. Washington, D.C., 2005: 15-17, color repro.